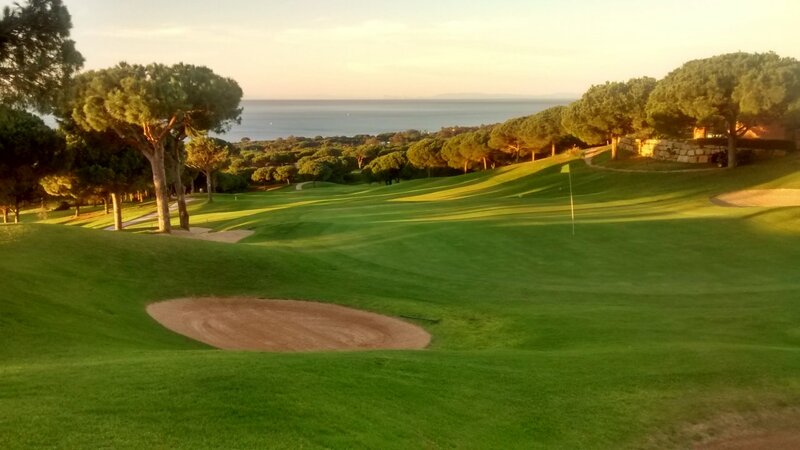 The course is fairly central on the Costa del Sol, quite close to the sea and some of the views over the Mediterranean are magnificent. 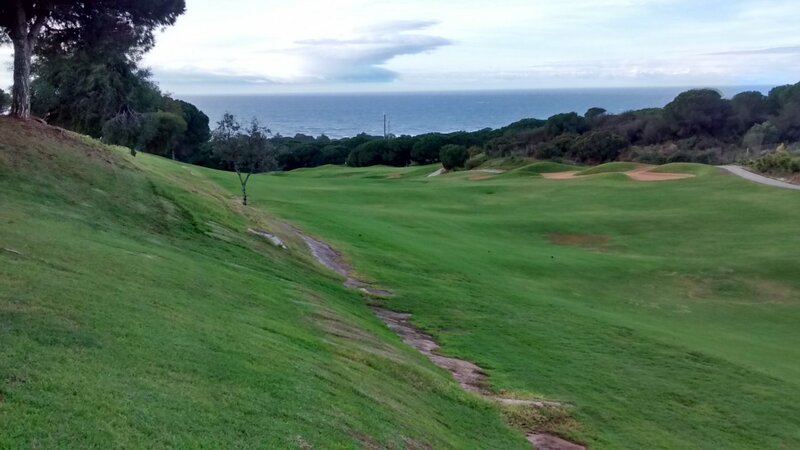 The 3rd hole (a par 4 with a very high elevation from the tee boxes down to the fairway) is probably the most spectacular hole on the entire Costa del Sol. There are good metal hole maps on every tee box, although now a bit faded. Cabopino is surrounded by some conservation areas, so it should always be fairly 'green'. What little property development there is around the course has also not really taken off. So the course has very little adjoining property development. The basic course design (the way the course is laid down on the landscape, the shape and contours on each hole) is quite good. Fairways are fairly narrow and in reasonable condition. Just off the fairway the grass is consistently mowed to the same standard (3-4 centimeters high). The grass there grabs your club and it is easy to just scuff the ball instead of getting a clean strike. Not a particular criticism, just notable. Elsewhere there are a lot of pine trees just off the fairways. So most of the time you can get some kind of recovery shot quite easily if you miss a fairway or green. The water hazards are well-placed (little lakes and some meandering streams between them). They seem in good condition with plenty of wildlife. There are quite a lot of well-sanded bunkers guarding greens and in carefully selected places where the contours of the fairway can divert your ball if you do not get the right line and length. A niggle I have with Cabopino is about 4 or 5 mostly straight holes where there is a bunker immediately in front of the green. Those bunkers are not well-placed – they seem to me just to be a not very subtle attempt to make the hole a bit harder. That type of hazard is irrelevant to a good golfer (they can just flop a wedge straight over the bunker and close to the pin) and is dull for me as a mid-handicap player. I think they should reconsider some of those bunker positions long-term. 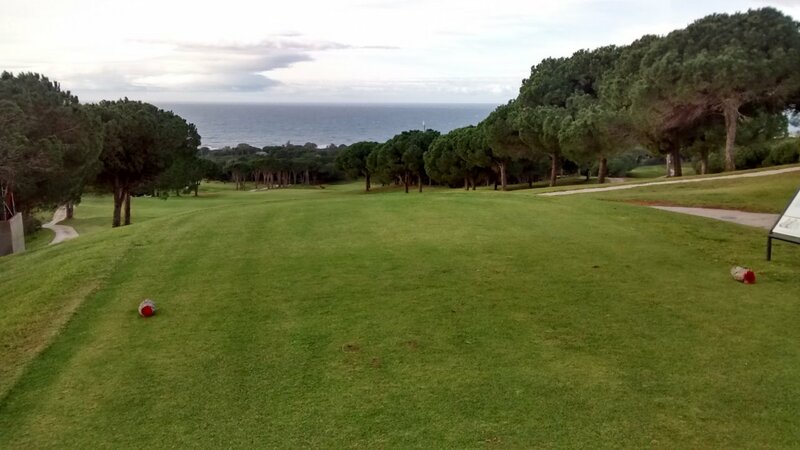 In 2013 the greens on Cabopino were in very poor condition. But the club recognised the problem and has put a lot of effort into fixing the greens. All greens are quite large. Many have significant tiers and slopes, so are quite tricky. The grass on the greens is above average quality, and the greens are medium-paced and now consistent. The club also had problems with buggies (not enough of them and in poor state). That problem has now been fixed in 2014. All the people involved in running the course are polite and friendly. This is not an expensive course. A number of cheaper courses on the Costa – often including Cabopino – band together to offer good discount rates ("play 5 courses in one week for only Euro.." type offers). That offer obviously attracts tour-group players looking for cheap golf. The course is good value for money, and I do recommend it - although it is too tricky for absolute beginners (handicap 30+) who should instead find an easier, flatter course. I am pleased that Cabopino has recently invested to get their golfing experience back up to a good standard. Last year I would not have recommended the course to anyone because some aspects were just too low quality. That situation has now changed, and I would consider playing Cabopino again any time - although it is not a style of course that I personally prefer. Cabopino is represented by the yellow dot. This shows that Cabopino is one of the shortest courses when compared to all other courses on the Costa del Sol, and is also relatively quite easy. An 18-handicap player going around this course can expect to score between 18 and 19 over par.